Mother’s Day is a special time of the year at MemberWhen. But we must admit, moms are on our minds long after the holiday has passed. From interviews with clients to water cooler chats about our own, moms remain a popular topic at MemberWhen. We nurture conversations and reflections of moms in an effort to capture those priceless memories of her, the ones that tell the story of her life and let her leave a legacy for years to come. The audio stories we produce reflect various people and chapters of life, and we would be fooling ourselves if we said our favorites didn’t include mom. A Gift, and a Thank You. It’s tough to put into words how much we care for our loved ones. And with moms, that task can become even more difficult. How do you properly express your love and gratitude to the woman who raised you? You can spend your lifetime doing it, or you can put those feelings and reflections into a MemberWhen that will last longer than a lifetime. This is why MemberWhen has become a popular gift for parents, particularly moms. 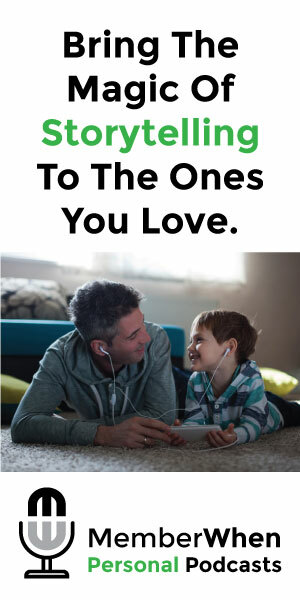 Children, young or old, come together to purchase these audio stories for their mother where they can express their love in their own words and reflect on her as a parent. In this MemberWhen, children share their favorite memories of mom, the lessons they learned from her, and their heartfelt messages to her. Once produced and polished with music, narration, and most importantly, the voices of her children, the final product is a slam-dunk gift that warms mom’s heart and reminds her of the great job she has done as a parent. Warning: this MemberWhen will make mom cry happy tears– and you will most likely shed a few too. Laughing & Reliving Memories Together. As fun as it is to surprise Mom with a MemberWhen, it can be just as memorable and enjoyable to include her in the process. A MemberWhen with mom allows a family to relive memories together. In this MemberWhen, mom joins her children and spouse in the storytelling process and offers a unique perspective on the family, their memories, and their journey together. This type of personal podcast gives mothers and daughters or mothers and sons the chance to reflect on their bond and preserve the special moments of their relationship. With how busy life gets and how fast children grow, a MemberWhen with mom offers a family the opportunity to laugh together, share their love with one another, and cherish the priceless stories that have been made possible by mom. Whether your journey as a mom is just beginning or whether you’re looking back and reliving the fun as a grandma, a motherhood MemberWhen celebrates you and all of the joy, adventure, and bounty that come with being a mom. We at MemberWhen wish all moms a very special Mother’s Day. Start your story, or celebrate your mom’s, with the gift of MemberWhen this Mother’s Day.